Sorry I have been MIA I am a little busy enjoying our new addition and spending time with my boys and Muscle Man. Maternity leave in the Summer with a Stay-at-home Dad is AWESOME!! Baby Girl came into the world on 7-26 at 10:57AM weighing 9'15 and 21.5 inches. BIG BABY, I am not sure where I was hiding her, guess it pays to be TALL! Last post talked about the the failed induction, after that I had a sour taste in my mouth for induction and prayed that baby would come on her own. 4 days later she did..
About Midnight I started to feel some cramping, it woke me up but I was able to flip over and get some relief. This continued throughout the night about every 30 minutes and then getting closer and more intense. At 4AM the contractions were coming stronger so I got up to take a shower and start getting ready. I woke Muscle Man at 4:30AM and we let Uncle Marky know that we were going to the hospital, he had stayed overnight to watch the Little Studs. We called the hospital, ANNOYING to talk to the people this is baby #3 I know what a real contraction is. By the time we left the contractions were 2 minutes apart. We arrived and I had to fill out some more ANNOYING paperwork while working through contractions. They put us in a triage room to check me, I was already dialated to 5cm so they put us in our real room. The BEST part was that I ended up with Gretchen a nurse we had met earlier the week who was a Runner and my good friend Tammy's neighbor. Gretchen was training Jessica who was also amazing!! By about 7:30AM I was in major pain and opted for an epidural, the Dr. was great, I barely felt anything and had some movement in my legs. Once the meds hit Muscle Man and I took a nap for about 90 minutes. By the time we woke they decided to check me again, I was at a 10!!!! Amazing I could be so relaxed while my body did the work. Trouble was my Dr. and Tall Sister had not arrived yet. There was another Dr. there who checked me and said we could wait since baby was still at a high station. Thankfully I had the epidural or I would not have cared to wait. Both arrived and it was time to PUSH! I am a good pusher, this I already knew, so when it was time I went for it. About 5 pushes or 5 minutes, not sure, and Baby Girl was born. I asked Muscle Man to check and tell me 100% that we had a girl, confirmed. They put her on my chest and she stopped crying and was cozy with Mommy. Her birth was so peaceful and wonderful I could not have asked for a better experience all around. The first night was a little tough since she was so big and I was not producing milk yet, she was up often and when she was sleeping I was staring at her. 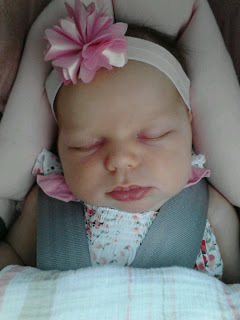 We were able to leave the hospital the next day at 3pm once she and I were cleared. I felt GREAT the whole time, very little pain and lots of energy. She is now 2 1/2 weeks old and a complete JOY! We have gone on walks, went to the zoo, went to a wedding and really enjoyed our family time. We are learning her sounds and needs. She is up a couple times a night generally to get a diaper change, nurse then back to her bassinet. We were due for a good sleeper, and are feeling very BLESSED!! Her carseat is her favorite place to sleep, making car trips a breeze. I was not successful with breast feeding with the Little Studs so although it is new I feel like she and I are doing a good job with it. I even fed her while the boys played at the park, whole new world for me! One thing about Breast Feeding is it makes me HUNGRY and THIRSTY!! WOW!! On a personal note I am 9 pounds from my pre-baby weight!! There is still some puffy tummy but I am super happy with how I feel and look. Baby knows when I have food on my plate and when I am on the computer....so I must depart. Hope to Blog again soon but I cant promise anything #priorities. Congratulations on your new little one! She is absolutely beautiful! I don't usually see family resemblance in newborns but I think she looks like you! Enjoy your time with your new little one! And yes, holy cow breastfeeding makes you ravenous! Congratulations! She looks just like you. Enjoy the fabulousness you have created! Congrats. She is adorable. Glad everything is going well. Wow, Tall Baby looks JUST like you! Congratulations! She's beautiful, congrats to you and tall family!!! Congratulations....baby girls are sure sweet little things! Congratulations! I've been following your blog for a couple of years and had a baby in June myself...mine was boy #3! 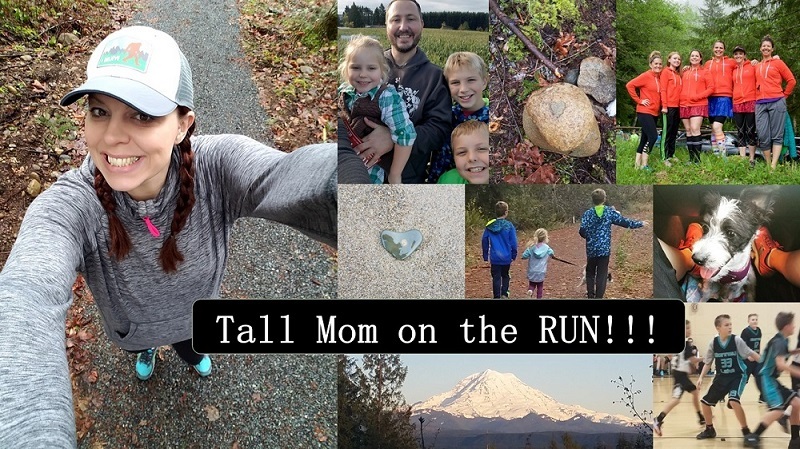 Glad you are feeling well and healing and can't wait for your first post partum race! I bet it went so well because you stayed so active during your pregnancy. You're such a good mommy! See you soon, I hope! Congrats, Mel; she's beautiful! All the best to the tall family.